Boko Haram has again attacked Rann, a town in Kala Balge local government area in Borno state, Nigeria. 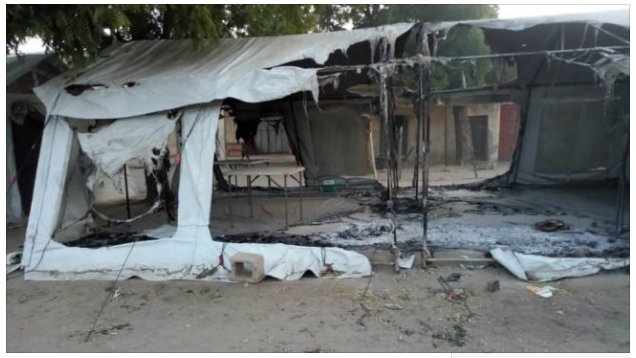 The insurgents destroyed the only healthcare centre in the frequently attacked region of the local government, UNICEF clinic. Sources within the local government area told newsmen that the Nigerian army repelled the insurgents after a fierce gun battle. Mijin Yawa, a resident of Kalabalge who also confirmed the attack, said the insurgents stormed the town with various caliber of weapons, Anti air craft guns and mounted trucks. “There may be a lot of casualties but from what i am hearing, the soldiers have repelled the attack and are dealing with the terrorist,” Yawa said. “I was told that some villagers fleeing the attack were also wounded during cross fire”. Another sources who prove anonymity, said the whole Rann village was thrown into confusion as many resident scampered for safety in the bush. Rann local government is housing over thousands of IDPs, who are supported by International Non Governmental Organisation(NGOs). The insurgents attacked the town in March this year, killed many security personnels and Abducted three aid worker. Calls to Sani Usman, the army spokesman, did not get through and his text messages were not returned.